This is a film that has been mentioned often in various groups I follow. So I'd been intrigued by it for a little while. It also helps that it has a pretty rad cover. Before I paid my $5 to rent it I decided to do a quick search online for reviews to see what the general consensus was before going in. To my surprise, it was decidedly mixed right down the middle. People either loved or hated it. There was no middle ground. Those that loved it often referred to it as the Scanners sequel we never got (prominently displayed on the poster), while others called it a cheap Scanners ripoff. So I knew going in it could go either way. I was curious myself to see what camp I would fall under. I will give them kudos for the great poster art though. It's not very often you see a poster that more than likely will be better than the actual movie. These days, it's always the other way around. Impressive effects. If there's anything that's going to stand out about this film, it will be it's use of some pretty stellar practical effects work, something that is becoming more and more a rarity. While they do use some CGI, it's done minimally, and when mixed with the practical stuff, you barely notice. Solid casting. Despite not knowing any of these actors, except for Larry Fessenden, they do a fine job in their roles, especially Graham Skipper in the lead, who was also the lead in Almost Human. He has an uncanny ability to do a ton of screaming and not look silly doing it. Because you know, when you're trying to make someone's head explode using telekinesis, you do a lot of screaming too. Psychokinetic movies are awesome. Really, when was the last time we got one? We of course always think of Scanners, Scanner Cop, Carrie, and maybe The Fury, but when was the last one we got? They seem to be an all too rare thing and that little sub-genre hasn't been tapped into nearly as often as it should. If there's anything this film proves, it's that these types of films are a dying breed and could certainly use a freshening up from time to time. One of the things that I notice almost immediately with this film is that while it's supposed to be a throwback to this specific sub-genre, and it takes place in the early 90's, it just doesn't look or feel enough like it. You could easily say this film takes place in the current time, rather than immediately being able to identify that it's supposed to take place in the late 80's or early 90's. I think a lot of that goes into how Joe Begos directs. None of it is stylized, and most of it is shot using handheld. If he really wanted to give it an 80's or 90's look, he easily could have done so with a much more streamlined visual approach, instead of shooting it the way most films are shot today. The Minds Eye is a good little film. It wasn't awesome, but the effects work in the second half completely make up for the first half, which tended to be a bit slow while setting things up. But trust me, if you can get through it, you'll be handsomely rewarded in the second half where it gets crazy and gory as hell with some outstanding practical effects work. And that's really where the film is going to grab most people, with the effects work. While the acting, writing and direction aren't bad, those won't be the elements of the film that people will walk away remembering. It'll be the badass head explosions and whatnot. The ending is pretty killer, especially for a low-budget feature like this. This is only the second feature film from Canadian director Joe Begos. His first was Almost Human, an homage to 80's horror films. Much in the way he directed that one, he tries to give this one another "throwback" vibe by setting this one in the early 90's. He does infuse some cool neon purple and blue colors from time to time, but overall these end up just being little touches here and there. Even the 80's style synch score seems to come and go, not really leaving any kind of an impact. 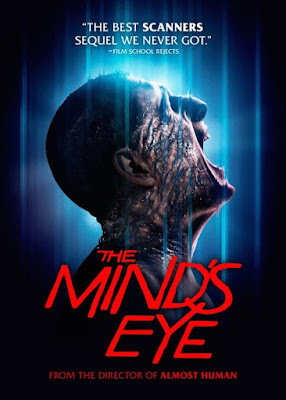 Other than that, The Minds Eye doesn't have a dated quality, which would have really pushed that vibe so much further. It constantly feels like it's missing something, and that's probably what it was. I think had a much stronger director been behind the camera, it would have turned out a bit better. I personally wouldn't call it a throwback, so I wish people would stop calling it that. It kind of tarnishes that sub-genre by comparing this film to some of those great earlier ones by De Palma and Cronenberg. It's definitely worth a watch, and there are things to enjoy about it, like it's effects work. More than likely though, you won't love it. It doesn't quite hit the mark like it could have, which is a shame because it has a lot going for it, and I admire them for what they were trying to accomplish. Cool, this one's on my to watch pile. I'll bump it up. Almost Human is good in places. I wasn't wild about it but I'm interested in where Begos goes as a director. I don't really feel he's improved honestly. The film is supposed to be "dated", yet you can't really tell at all. The only reason the film works as well as it does is because of the effects work and the last act. He could really do with some brushing up on his visual aesthetic.